With a real warm and welcoming feel as you cross over the threshold, this four bedroom semi-detached family home is one not to be missed! Beautifully cared for over the years, this lovely home is being sold with no chain and boasts a generous rear garden, driveway and garage. Plus the usual uPVC double glazing and gas central heating system. Situated in a much sought after tree lined road, near to services and amenities in Wallasey Village and Liscard including highly regarded local schooling, especially St George’s Primary. Great base for commuting with frequent bus services, Wallasey Grove Road train station and the M53/Liverpool tunnel just a short distance away. Interior: porch, hallway, living room, dining room and breakfast kitchen on the ground floor. 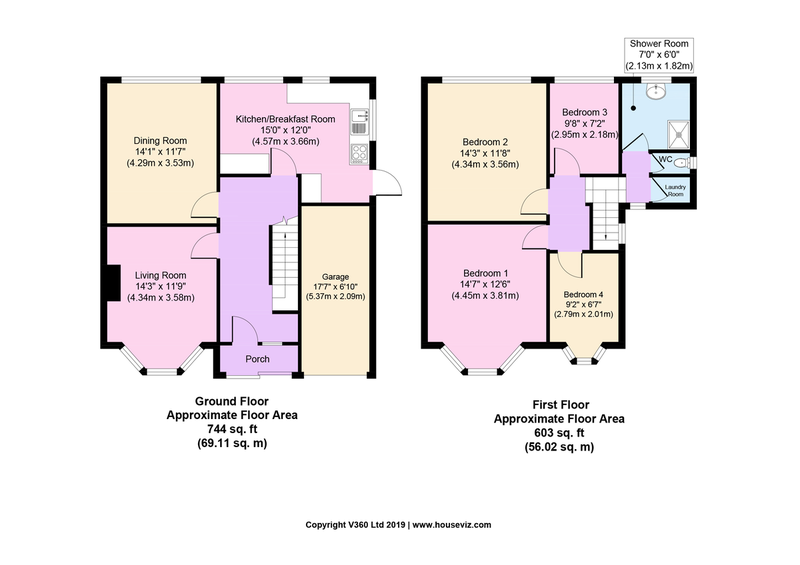 Off the split level first floor landing there is a boiler room, four bedrooms, separate WC and shower room. Exterior: delightful rear garden with a private feel, front garden, driveway and garage. Viewing is a must! ENTRANCE & PORCH Pleasant approach through the front garden to a sliding uPVC double glazed door that opens into the porch area with tiled flooring and further uPVC double glazing to side. Inner part glazed uPVC double glazed door with side uPVC double glazed window, both allowing light into the inviting hallway. HALLWAY A perfect place for greeting guests! Meter cupboard, plate shelf and telephone point. Two handy storage cupboard, central heating radiator and heating thermostat. Solid wood flooring. Doors off to the ground floor accommodation. LIVING ROOM 14′ 03″ x 11′ 09″ (4.34m x 3.58m) uPVC double glazed bay window to front elevation with a pleasant outlook. Picture rail, television point and two central heating radiators. DINING ROOM 14′ 01″ x 11′ 07″ (4.29m x 3.53m) uPVC double glazed window to rear elevation having fitted blinds, with a view into the garden. Picture rail and two central heating radiators. BREAKFAST KITCHEN 15′ 0″ x 12′ 0″ (4.57m x 3.66m) What a spacious dining kitchen! Range of matching base and wall units with contrasting work surfaces and tiled splash backs. Sink and drainer with mixer tap over, sitting below uPVC double glazed window to side elevation, plus two further uPVC double glazed windows that look out into the rear garden and Flynn’s Piece. Cooker point. Space and plumbing for washing machine. Space for fridge freezer. Picture rail, ceiling spotlights and central heating radiator. Vinyl flooring. uPVC double glazed door to outside. LANDING Turned staircase leading up to a split level first floor landing with two uPVC double glazed windows and two loft access hatches. Doors off to the first floor accommodation. BOILER ROOM uPVC double glazed window to front elevation. Handy shelving, vinyl flooring and ‘Worcester’ combi boiler. Note: image used is a further view of the Landing. BEDROOM ONE 14′ 07″ x 12′ 06″ (4.44m x 3.81m) uPVC double glazed bay window to front elevation with a pleasant outlook. Picture rail, coved ceiling and central heating radiator. Original tiled fireplace and fitted storage in both alcoves. BEDROOM TWO 14′ 03″ x 11′ 08″ (4.34m x 3.56m) uPVC double glazed window to rear elevation that looks across the garden and into Flynn’s Piece. Picture rail, coved ceiling and central heating radiator. Original tiled fireplace. BEDROOM THREE 9′ 08″ x 7′ 02″ (2.95m x 2.18m) uPVC double glazed window to rear elevation, again with an outlook across the garden and Flynn’s Piece. Picture rail and central heating radiator. BEDROOM FOUR 9′ 02″ x 6′ 07″ (2.79m x 2.01m) uPVC double glazed picture bay window to front elevation. Picture rail and central heating radiator. SEPARATE WC uPVC double glazed frosted window to side elevation. Low level WC, part tiled walls and vinyl flooring. SHOWER ROOM uPVC double glazed frosted window to rear elevation. Walk in shower area and pedestal wash basin. Ladder style radiator, extractor fan and tiled walls, plus vinyl flooring. REAR EXTERIOR Having a private feel backing onto Flynn’s Piece, this delightful rear garden boasts a lawn and flower/shrub borders. Paved patio areas ideal for some garden furniture, especially a table and chairs set ready to enjoy some alfresco dining over the summer season. Outhouse, timber shed and outside water tap. FRONT EXTERIOR Paved driveway providing off road parking. Side lawn with flower/shrub borders. Access to both the garage and side gate leading into the rear garden. GARAGE Accessed via an up and over door. Having a side window and door, plus lighting and power. LOCATION Gloucester Road can be found off Claremount Road approx. 1.1 miles driving distance from our Liscard office.